“The polls have made it clear that the BJP’s ideology is being accepted, appreciated and supported by more and more people in the country. It is great for democracy,” Modi said. Expanding its footprint and declaring that “a strong foundation has been laid for a building by 2019” when the next Lok Sabha elections are due, the BJP Thursday swept to power in Assam, its first government in the north-east, and made significant gains in Kerala where its first legislator was elected. For the Congress, the drubbing in Assam, where it ruled for the last 15 years, turned into a nightmare as results came in from other states. It was voted out of power in Kerala where it was trounced by the CPM-led LDF, and its alliances with the Left in West Bengal and the DMK in Tamil Nadu were handed crushing defeats by the ruling parties of Mamata Banerjee and J Jayalalithaa. The stunning success in Assam and increase in support in Kerala, West Bengal and Tamil Nadu, coupled with the poor show of arch rival Congress, had the BJP in raptures. 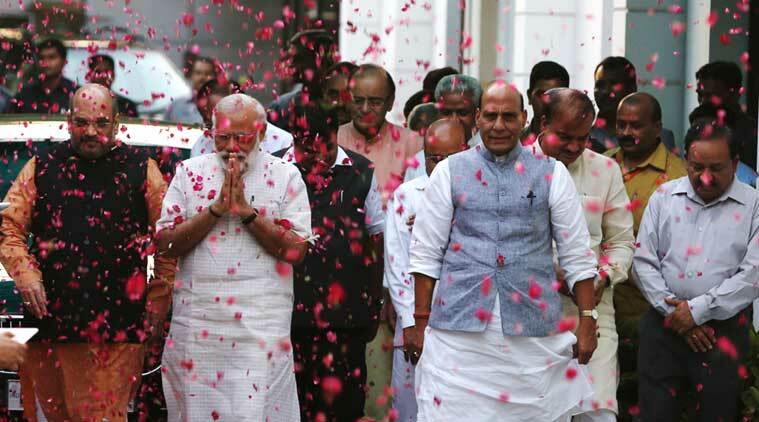 Prime Minister Narendra Modi turned up at the party headquarters in New Delhi to tell party workers that the “results are extremely encouraging for the BJP and NDA”. For the BJP, the win in Assam — Union Minister Sarbananda Sonowal is expected to head its first government there — will open the gateway to the north-east. “Of the seven states, except Tripura and Meghalaya, others are favourable to the BJP. The Congress has lost ground in many states,” a BJP leader said, adding that the Prime Minister’s direction that two Union Ministers should visit each state every month has started showing results. “There is goodwill in the states for the Prime Minister and the party,” the leader said. What may also work for the BJP is the return of the Trinamool Congress and AIADMK in West Bengal and Tamil Nadu. Both Mamata Banerjee and J Jayalalithaa are considered “friendly” by the BJP. Their return will impact numbers in the Rajya Sabha where the BJP lacks support to push through its legislative agenda. Prime Minister Modi was among the first to congratulate Banerjee and Jayalalithaa as the results came in. Banerjee has already announced her support to the BJP’s key reform legislation. “We have ideological differences with the BJP but we will always lend support on issues that are beneficial to people. We will support GST,” she said in Kolkata. Although Tamil Nadu has reservations on GST, the AIADMK has been supportive of the BJP at crucial times in Parliament. Speaking to reporters at the party headquarters, Shah tried to drive home the point. “In a way, it’s public approval of two years of work of the Modi government. It is a win for positive politics, we can see the beginning of politics of performance. People have also given a lesson to those who have practised negative politics and tried to derail development by obstructing Parliament,” he said.